The Book of Remembrance was formally dedicated on November 11, 1962. It listed the names of men and women "who were killed in action, died of wounds, illness or injuries in the First Great War (1914-1918), the Second Great War (1939-1945) and in the Korean Conflict (1950-1953)." Since its unveiling in 1962, the Book has been on permanent display at Peterborough City Hall. But late last fall, Conservators at the Peterborough Museum & Archives (PMA) removed the original Book of Remembrance from the lobby of City Hall as a regular inspection had revealed that the book had begun to experience some cockling—where paper becomes buckled and will not lie flat—and warping. At the time, the book's removal was expected to be temporary but as PMA Conservator, Cindy Colford, notes, "this kind of minor damage is typically an early warning sign that a paper object is being stored in an environment where the relative humidity is out of its ideal range." Conservation treatments on the original have thus far been successful, but in order to ensure that this valuable artifact is preserved for future generations it will need to remain in specialized storage at the Museum. 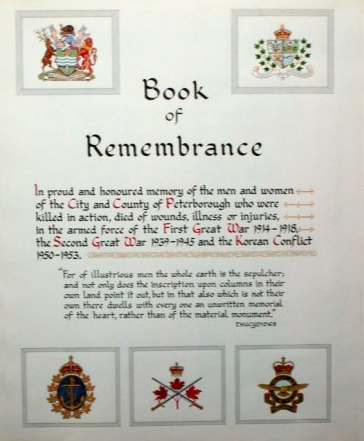 Back in June, Peterborough’s Cenotaph Committee approved an expenditure amount of up to $5,000 from the Cenotaph Trust Fund for the purpose of the reproduction and binding of the Book of Remembrance. The replica has now been completed and will be available for public viewing at the Museum from November 5 to 20, 2011. * It will later be placed on permanent display back in the lobby of City Hall. Visitors will be able to access the replica directly and can view any or all pages. A full digital version of the Book of Remembrance is available online by clicking here. *The Book of Remembrance will not be at the Museum on November 8th between 9 a.m. and 2 p.m. as it will be on display at the Peterborough Armories as part of the Veteran’s Week Celebration and Educational Fair.